Let us know you’re participating by commenting on this post below. If you’re going to be tracking what you read/listen to on your blog or on Goodreads, LibraryThing, YouTube or some other site, include a link to your blog/shelf/channel/profile in your comment. If you’re not tracking your reading online, keep a list some other way. Make it a social experience! Share your challenge progress and get to know other participants by using the hashtag #hubchallenge on Twitter and Instagram. Once a month, we’ll publish a check-in post. Leave a comment to talk about what you’re reading for the challenge. If you’ve reviewed those titles somewhere online, include links to those reviews! Otherwise, let us know what you thought of the books in the comments. There will be an finisher form embedded in each check-in post, so once you’re done with the challenge, fill out the form with your name and contact information. Format matters: a title that has been recognized for both the print version and the audiobook version can be both read and listened to and count as two books, but a book that has won multiple awards or appears on multiple lists in the same format only counts as one title. Books must be read/listened to (both begun and finished) since the award winners and selected lists have been released and 11:59pm EST on June 22. If you’ve already read/listened to a title, you must re-read/listen to it for it to count. The grand prize winner will be selected by 11:59pm EST on June 23. The winner will be notified via email. If you have any questions or problems, let us know in the comments or via email. Happy reading! 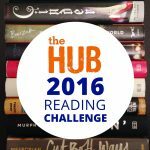 YALSA’s The Hub 2016 Reading Challenge Begins! Previous Post Amazing Audiobooks and Quick Picks Lists are Moving to The Hub, and You’re Invited to Be a Part of the Team! This will be my 6th year participating and I hope to get some of my Teens on board as well! Thank you HUB team! I’m in for my third year and very much looking forward to it. I will be participating! As always, I’ve read a lot of books on the list, so this always helps me push a little further out of my regular reach. I’m in! I love doing this reading challenge! I love this challenge! The best part is all the great books I can recommend to my students!! This sounds like fun! I am always looking for a way to push myself and have a good challenge with my students. I am in! I will be keeping track on Google Sheets and possibly Goodreads..
Can’t wait to discover some new favorites! I’m going to try this again. Last year’s attempt was pitiful but I’m feeling more hopeful this time around. I’ll track on Good Reads and twitter. I’ve been waiting for this announcement! I’m in! The Google Doc containing the list of titles is only 96 items long, and four of them (If I was Your Girl, Salt to the Sea, Nimona, and Burn Baby Burn) are listed twice. I’m so in!!! I look forward to this every year! YAY! I’ve been waiting for this! I’m participating! I’m going to try, once again. Hopefully this year I’ll read 25! I will participate, sounds great! Looking forward to participating in this year’s challenge. I will be recording my books on Goodreads and hope to encounter some great reads along the way. I’m in! I came so closer to finishing last year but hit a reading road block. I’ll be tracking on my blog but mostly on Goodreads: https://www.goodreads.com/review/list/3591728-jennie?shelf=2017-hub-challenge-read. Participating! Hopefully I get closer to victory this year! Haven’t decided whether I’ll track my progress on my blog or not, will let you know if I do. Are the books on the list of 98 the only ones eligible, or any on the lists on the award winner links? For lists like BFYA and Quick Picks, they focus on the top ten (for Rainbow we included a couple YA titles that weren’t on the top ten). Really, the point of the challenge is to read great YA or teen-centric books that you’ve missed and get outside your comfort zone, so if you want to include a few from the linked lists that didn’t make the “top ten” cut, go ahead. It’s your challenge. Use it how you see fit. I’m giving it a shot! Thanks for the challenge, I’m going to give it a try. I’m in. Loved it last year because it forced me to read out of my comfort zone. I’m in! One of my favorite times of the year! I didn’t do very good last year but I am up for the challenge! Count me in! I am in! hopefully I will do better than last year! The other list has them all, so it’s just the spreadsheet. Also, I have a question – The Only Road by Alexandra Diaz is the author award winner for the Pura Belpre, but it’s not on the list. Lowriders to the Center of the Earth (the Belpre honor) is, and from what I can tell they’re meant for about the same audience. Should it be on the list too? Or should Lowriders not be? I was starting to wonder if you weren’t doing the challenge this year. Glad to see it. I’m tracking on GoodReads. I just finished reading two on the list, so I’m glad you can go back to when the announcements were made. Finally! Thought it was gone this year. I am definitely participating – gets me out of my comfort zone. Question: The list has 95 titles, the spreadsheet only 90. Which is correct? We fixed the spreadsheet – when I copied it I cut of a couple books from the authors at the end of the alphabet! 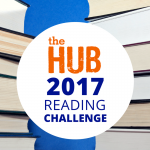 I love The Hub Reading Challenge! I’m definitely in. I’ll be keeping track on paper and blogging about favorites at bratneysbooksandmore.weebly.com. This will be my first year participating, and I am very excited! My daughter, Sarah, and I are pleased to participate. Wonderful idea! Love that you’re doing it with your daughter! Happy reading. Participating! 3rd times a charm in 2017!! I will be participating. Last year the challenge pushed me to read books I may not have picked up! Follow me on Twitter as @mwreads. It’s interesting to read what other people participating in the challenge thought about the books, but there are too many people posting to their Goodreads and personal blogs to check each one. Can we make a group page on Goodreads? I will be participating! Looking forward to it! I will TRY to do this… I am a slow reader! I will definitely be participating. I look forward to learning about some new YA books through this challenge. I’m late to the game, but I’ll be participating. Here’s the link to my goodreads page. I’ve really been looking forward to this! I’ll be keeping track of my reading on Goodreads and through my library’s book review blog. This is my 3rd year! I will participate and share my thoughts on my organization’s twitter page @fchslib. Looking forward to discovering some great titles! I love participating in this challenge and reading all the comments and reviews! I will be participating and tracking on Goodreads. Thanks for running the Challenge again this year!! Did I miss any check-in posts on the blog since February 4? Like last year, is it okay to listen to an audiobook of any given selection in print? Since the objective of the challenge is to encourage exposure to more YA reading, I think it’s appropriate to accept the audiobook listening. Thanks for your consideration! Check-in posts will happen monthly at the end of each month, rather than weekly as in the past. Audiobooks count for those books that won audiobooks, but if you want to listen to them for books that won in print, no one will know but you! Use the challenge as you see fit. It’s about keeping up with great YA literature, so do what works for you. I don’t see The Serpent King on the list. This is my first year trying to read all of the Morris Award Finalists. I don’t want to break any rules, so I am just checking that it counts toward the 25 since it was the Morris Award winner. The Serpent King counts and is on the list! I’m in, but I’ve already read so many of these, it really will be a challenge. Participating for the first time! I will be tracking my progress on Goodreads. I’m in! First timer on this and a little daunted about fitting it in with all my other reading but here we go! Yes, anyone can participate. ALA staff just can’t win the drawing. Can’t wait to read through all these fantastic books. It’s going to be tough to only choose 25 this year! Fun! I’ll be participating and keeping track using a shelf on Goodreads! I’m going to participate too. and tweet updates @kelsinbklyn. This is a great motivation to help me stay on track reading the most recent ya on my list! I’m getting a super late start this year, but I’m excited about a lot of the titles. This will be my 4th year and I’ll keep track of my progress on http://www.bibliobeat.com. I’ll start off with some of the graphic novels to maybe “catch-up” a little. I’m not a big graphic novel reader, so this will help me widen my horizons! I will give it my best, though I am starting VERY late. But I’m up for the challenge! I will track my progress here: http://everydayteenlibrarian.blogspot.com/.